Imagine waking up not knowing where you are or why you’ve been placed in the dark in the rescue position and the person you love most nearby in a similar state. You really have no memory of what happened. You were about to do something significant in your life and don’t recall whether you actually did it. It turns out that you were in the wrong place at the wrong time and be required to use all of your ability to rescue the one you love AND the United States. A typical day for Mr. Achilles, except that he becomes the number one suspect in this page turner by Tim Tigner. 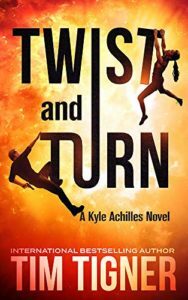 I am loving this series and the chemistry between Achilles and Katya. Read this book. This article was published on Jan 23, 2019 . It is tagged kyle achilles, tim tigner, twist and turn. You can follow any responses to this article through the comment RSS feed.